Mike Leonard is a lucky man. It’s not everyone who gets parents like Jack and Marge. At eighty-seven, Jack is a pathological optimist with an inexhaustible gift of gab. Marge, Jack’s bride of sixty years, though cut from the same rough bolt of Irish immigrant cloth, is his polar opposite–pessimistic and proud of it. What was their son, Mike, thinking when he took a sabbatical from his job with NBC News so he could pile these two world-class originals along with three of his grown kids and a daughter-in-law into a pair of rented RVs and hit the road for a month? Mike was thinking that he wanted to give his parents the ultimate family reunion. And so, one February morning, three generations of Leonards set out on their journey under the dazzling Arizona sky. Thirty minutes later, one of the humongous recreational vehicles has an unplanned meeting with a concrete island at a convenience store. Thus begins the adventure of a lifetime–and an absolute gem of a book. 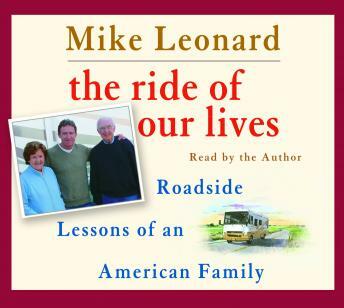 In the course of their humorous, often poignant cross-country tour, from the desert Southwest to the New England coastline, the Leonards reminisce about their loves, their losses, and their rich and heartwarming (and sometimes heartbreaking) lives, while encountering a veritable Greek chorus of roadside characters along the way. The home stretch finds the clan racing back to Chicago, hoping to catch the arrival of the next generation, Jack and Marge’s first great-grandchild. Through it all, Mike pieces together acentury of family lore and lunacy–and discovers surprising sides to his parents that allow him to see them in a whole new light. Mike Leonard has captivated millions of television viewers with his wry and witty feature stories for NBC’s Today. Now he brings that same engaging charm and keen insight to the foibles and passions of his own blessedly unique family. By turns uproariously funny and deeply moving, The Ride of Our Lives delivers a lifetime of laughs, lessons, and priceless memories.